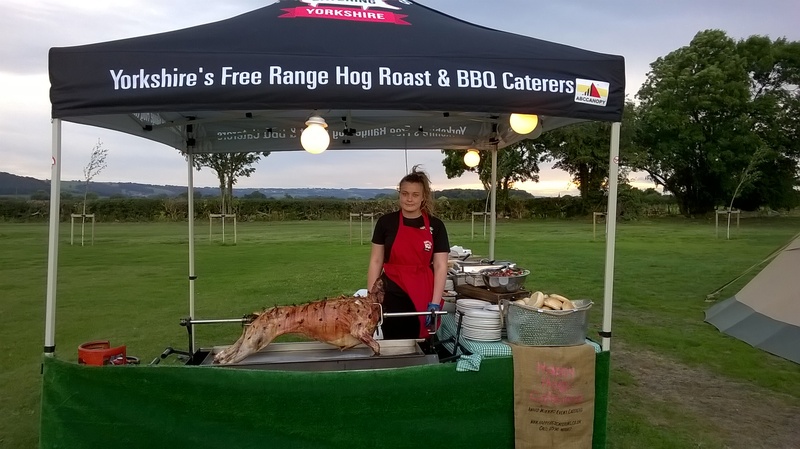 Spit Roasts from Leeds Own Free Range Hog Roast and Barbecue Caterer. Using free range meats sourced locally to Leeds for each spit roast event, we cook on the spit and then serve and carve straight from the spit directly to guests letting them get really close to see and smell everything, once service has finished our spit roast team will collect in plates and rubbish before discreetly clearing everything away taking all our rubbish with us, leaving our clients free to enjoy themselves completely hassle free. 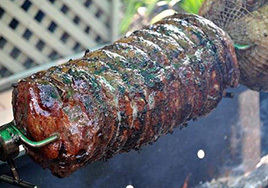 Spit roast Yorkshire lamb studded with rosemary & garlic, basted in its own juices and served in freshly baked buns. Our Spit Roasts menus include a fully uniformed chef and assistant to cook & carve for your guests at the agreed serving time, a 3×3 meter catering gazebo, serving tables with table linen, bread basket, disposable plates & paper napkins. All spit roasts menus come with quality disposable crockery and cutlery, but why not upgrade to 8″ porcelain plates and stainless steel cutlery or 10″ porcelain plates and stainless bead design cutlery. We also offer upgrades on dessert bowls and stainless steel spoons.